Dolphins quarterback Ryan Tannehill threw three interceptions in the season finale against the Jets on Sunday. MIAMI GARDENS, Fla. — Dolphins wide receiver Mike Wallace beat his man on a stutter go route with 8:58 remaining in the second quarter and Miami up a touchdown. Wallace — poised for his second score of the game — instead watched as quarterback Ryan Tannehill’s throw sailed just out of reach on the third-and-six play. 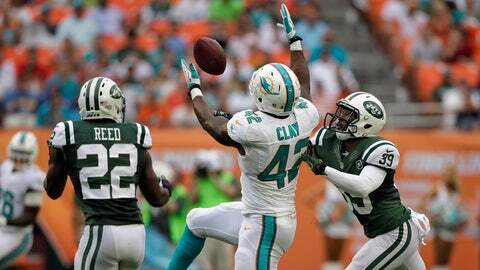 It personified the 2013 season for the Dolphins, which came to an end Sunday afternoon in a 20-7 loss to the rival Jets at Sun Life Stadium. "It was just all day whether it be in the run game, throwing the ball or catching the ball," Tannehill said. "We just missed opportunities we should’ve taken advantage of." The same could be said of the season’s final outcome. Takeaways & observations: Christina De Nicola breaks down Miami's home loss to New York. Recap: Dolphins blow shot at playoffs with another loss to a division rival. Hall of Famer Don Shula talks about the current state of the team. Two weeks ago, Miami (8-8) found itself two wins from its first postseason berth since 2008 and second trip in 12 seasons. Riding high after a 24-20 victory over the division-leading Patriots, the Dolphins seemed ready to continue their three-game win streak en route to January football. Standing in the way were two AFC East rivals — the Bills and Jets — both with below-.500 records. But poor play and missed opportunities plagued the team’s playoffs chances. "We didn’t finish strong. 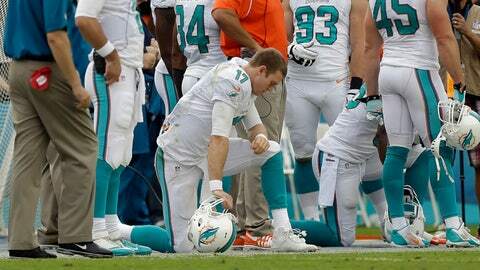 It’s that simple," Tannehill said. "We didn’t finish the way we wanted to. None of us saw this coming. Obviously, last week didn’t go well and this week we moved the ball early in the game but we didn’t score points and in the second half." After starting from their own 10-yard line down 14-7 to New York, the Dolphins marched down the field with four minutes to go in the third. On third-and-six from the Jets’ 29, Wallace slipped and Dee Milliner intercepted Tannehill for the first of his three turnovers. Early in the fourth, Jets kicker Nick Folk missed a 35-yard field goal that kept it a one-score game. Five plays later, the Dolphins punted instead of capturing momentum. "We didn’t capitalize," said Wallace, who caught five passes for 25 yards and a touchdown. "We had a lot of chances. Even missed a field goal and gave us an extra chance and we still didn’t take advantage. "That was our chance to go down there and make it a different game. We just didn’t make it happen. We have to step up and make plays. It’s nothing magical. We have plenty of opportunities." Miami capped its season averaging 19.8 points per game. During one stretch of the season, the Dolphins failed to score more than 23 points in nine straight games. Three of their losses were decided by a touchdown or less. "We’ve got to put up more points," Wallace said. "You’re not going to win too many games scoring seven points. We have too much talent to be 8-8. Everybody’s just got to step up — starting with me." Over the final two losses, the Dolphins mustered just 399 yards and seven points. The ground attack entered Sunday the NFL’s seventh-worst with 89.9 yards on average per game. Lamar Miller rushed just three times against Buffalo, but saw that many carries by the second drive Sunday. Despite the additional play calls, the rushing game managed just 92 yards on 22 carries on Sunday. "We haven’t made enough plays," head coach Joe Philbin said. "Certainly (Sunday) we didn’t make enough plays. We had some opportunities and just didn’t make enough plays to get consistent. I thought we ran the ball well. I thought we protected the quarterback better than we have. … I thought we had some balance. I thought we were in manageable situations. We just didn’t execute well enough." Tannehill went 20-for-40 with 204 yards, one touchdown, three interceptions and a 42.1 passer rating. Earlier this month, Tannehill outdueled Tom Brady. Entering Sunday’s matchup his 92.1 rating in December served as evidence he was playing his best football. The second-year player said he would look at tape of the game Sunday night. The sting of the loss would take a while to go away. Following his first season in Miami, Wallace said he needs to take it upon himself to be a leader on this team. "All those little plays we missed we’re capable of making those plays," Wallace said. "They’re right there on our fingertips. We lost so many games like that. You can’t play like that."